I have written before about the points-earning Facebook app run by Le Club Accorhotels (the loyalty scheme for Ibis, Sofitel, Novotel, Mercure, M Gallery etc) but I thought it worth another mention. 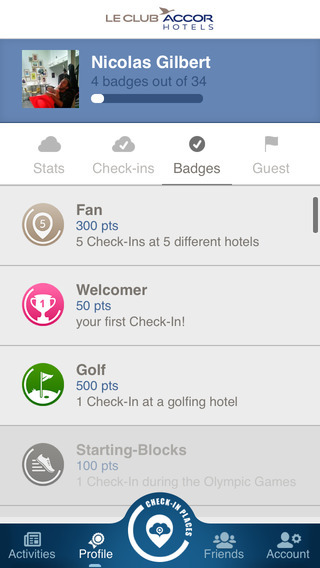 It offers bonus points on every stay when you do a ‘virtual check-in’ via a special app during your visit. You will need to add the Accor ‘Places’ app to your Facebook account or download a specific ‘Places’ app for your iOS or Android device. The links for the downloads are here. Note that the smartphone apps still require you to link to Facebook in order to work. Each time you are staying at an Accor property – you cannot earn points simply by popping in – you open the Places app or Facebook and register. As long as your Le Club account shows that you are staying at the property, you will earn points, although Accor is slow at adding new hotels to the list of hotels included. You do NOT now have to access the app whilst you are physically in the property. You can check in retrospectively for up to six months after checking out. This is helpful for anyone who cannot access Facebook from their work IT equipment whilst travelling or who does not want to run up roaming charges on their mobile. The different ‘badges’ that you can collect are listed in the app. This takes away some of the mystery and confusion that originally surrounded the earning process. You start by earning 50 Le Club Accorhotels points on your first check-in and then proceed to higher bonuses based on multiple stays at different brands (or the same brand) or different countries. Three stays at the same hotel earns 300 points, for example, whilst five stays at different Accor hotels also earns 300 points. Ensure you set the privacy settings in the app to ‘Only Me’ if you don’t want Accor to broadcast your check-in to your Facebook wall. Accor points have a fixed value of 2 Eurocents per point. Whilst none of these will make you rich, there is enough there to justify the few seconds work required to ‘check in’. You can find out more by watching the short video here. Whatever you do, don’t attempt to add more than one historical check-in at a time. I added three, all with different dates and they all went through with the date of the first stay. Funnily enough, that first one has been validated but the other two are stuck at pending. No way of removing them either – I did notify Accor of the problem but it hasn’t been rectified yet. And the iOS Places app has never worked for me. Can’t even log in. All of mine are showing as pending – is this a bad thing? ‘if you want to avoid roaming charges on your mobile’?? Surely, as a member you’d be getting free WIFI in the hotel?? iOS app doesn’t work. Reading the reviews, not worked for ages. Comments on Flyertalk yesterday said it was, I thought it best to check knowing Accor …. It’s been back up for a few weeks now. I’ve had literally thousands of extra points via the app over the last 12-18 months. You need to go to settings scroll down to Facebook and login to Facebook account there. I.e. You need to login to your Facebook account via settings. One you have done this you should be able to use the Places app. Yep. Was down for a bit but has been back up for several weeks now. I’m logged in right now ! Install again, still doesn’t work. Just hangs after pressing the ‘via Facebook’ button. I have had 11,000 points from this app so far, not too many more I can get, which is crazy as the most loyal customers are not rewarded. I have had some funny badges given, two stays in Windsor and Newcastle in Australia where treated as UK stays! 11,000 points is over €200, so I’d say that you’ve been rewarded. It’s true that you reach a point where there’s nothing more to do. I think the real business motivation for the scheme is to persuade you to try out different Accor brands (and it worked on me – I went from the occasional cheapo Ibis night to week-long stays in Novotels). It’s like a crap version of Accelerate! Actually, that’s not true, regardless of what they say. I’ve just transferred some e-rewards points to my mum’s account, where she had 11000 points due to expire in December – the expiry date has been reset to November next year. Interesting, it’s not what happened with any extra points I’ve earned from Accor games, etc – they’ve never reset the expiry, only stays. This has been consistently the case for a while. Is it only eRewards transfers that reset it I wonder?? Having only one point credited will still extend life of existing points until the 31rst of december 2016. Transfer of hertz rewards points can work. Or just go and buy a croissant at a Lenôtre shop in Paris or Cannes, and present your accor card to have the points credited the following night. It may work on the Lenôtre internet shop, but have never used it, and I do not know if they deliver outside France. From the first of january 2017 indeed only a stay with them (or holding a meeting) will extend points. The rule has always be this one. But for the last 4 years was not enforced (an It issue I guess, profitable for us). Slightly OT: has anyone successfully credited points from Hertz gold circle to Le Club Accor? I’ve tried several times and the points just stay in my Hertz account, and I’ve just looked and Accor is no longer in the drop down list on the Hertz website page for transferring to other schemes. I got this. These were the old rules so not sure what is new – perhaps no earning on food and drink on Expedia? Places was also a good way to earn points to platinum. But the Places avenue to get status is being withdrawn end 2016. My places checkins in SIN got credited within a few days this week. Also did a matress uber run in Jakarta this morning to get more accor points from places than the cost of the stay.